Get top-quality jewelry, watches, and repair services, from the professionals at Alex Jewelry. 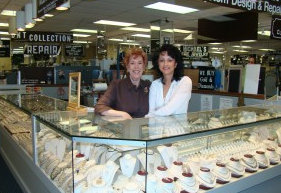 With more than 30 years of experience, our friendly, professional staff offers an extensive selection of fine jewelry and watches. Whether you're looking for jewelry, watches, or you need us to repair your pieces, we're sure to exceed your expectations. We're conveniently located in the International Jewelers Exchange on the first floor entrance door B, so stop in today and put our superior service to work.